More Dots, This Time in Yellow! I warned you that I was smitten by the dots style and since the pink one I did sold so fast, I thought I would try it in another color. And since I had quite a bit of the paint leftover from the yellow ombré lingerie dresser (you can see it here), it seemed a no-brainer to do it in yellow. 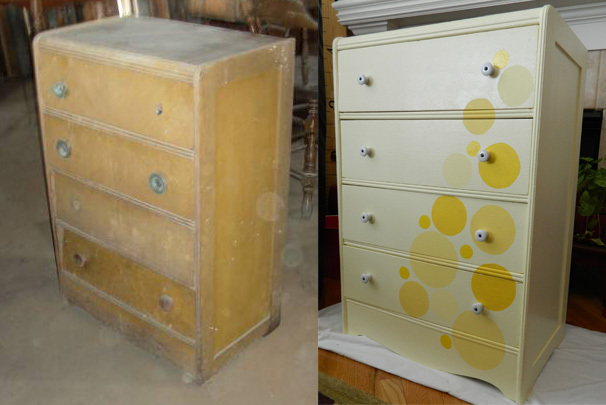 Since I have transformed so many dressers, the process is also pretty routine. The dresser came from a gentleman who was clearing out a floor of an old warehouse and apparently had many pieces of furniture to sell. I am definitely going to go back to this man again. I picked this piece up for ten bucks! It did require a little work, as there seemed to have been something that gnawed at the bottom of one side, but this is what wood filler was made for! Two of the drawers required a little glue and one drawer needed a new bottom. All easy-peasy, as me and the Kid have become quite adept at fixing drawers. I think the only thing I really need more of is long clamps, as I resort to using paint cans to use as weights when I’ve used the two clamps I do have that are long enough to stretch the width of a drawer. Once the drawers have been worked, it is back to the process that seems to work the best: repair, sanding, priming and then painting. Again, to paint the “dots” on the fronts, I laid it on my ottoman in front of the couch and painted them by hand while I watch a movie. Again, it was only the darkest shade of yellow that required a second coat, all the others have a built in primer that seems to help then get really solid coverage. When the dresser had dried, it was time for handles. I had picked up really nice ceramic knobs from Habitat for Humanity’s ReStore for fifty cents a piece and they had cleaned up very nicely. They were a nice crowning touch. So, tomorrow I start a new job. I’ve been off for the last siz months or so and frankly had really started enjoying the break. But all good things must come to an end, so one of the “projects” I did today was to return my dining room, kitchen and entry way back into their respective rooms! Cleaning and clearing and organizing and putting tools back out in the garage. It might seem funny, but I miss being surrounded by my projects. It isn’t all put away, though, as the dresser the Kid has been working on is still in the house, it just needs handles. I moved all the completed projects out into the third bay of the garage, now awaiting new owners. And we won’t even talk about the insanity that has overtaken my sewing room! Okay, dinner is just about ready, I just wanted to get this post completed and published. I am just two or three posts from my “100th” post and I’ve been trying to figure out what I am going to write about. I am excited to hit this milestone in blogging! Thanks for dropping by! Keep crafting and creating beautiful things… it is what keeps us sane!